The death toll in Banani fire has jumped to 19 as the firefighters recovered more dead bodies from the 22-storey building, officials said. The fire at the FR Tower was brought under control on Thursday evening. Then fire fighters entered the building. According to fire service control room, at least 19 people were killed and 70 others injured in the devastating fire. The bodies of seven victims have been identified as Parvez Sazzad, 47, Amena Yasmin, 40, Mamun, 36, Sri Lankan citizen Niras Chandra, Abdullah Al Faruq, 32, Maqsudur, 66, and Monir, 50, said Banani police station officer-in-charge Farman Ali. According to police, Amena succumbed to her injuries in the capital’s Apollo Hospitals while Mamun, Maqsudur and Monir in United Hospital and Abdullah Al Faruq died after he was taken to Dhaka Medical College Hospital. The inferno erupted barely a month after at least 70 people were killed in Chawkbazar where illegally stored chemicals exploded. 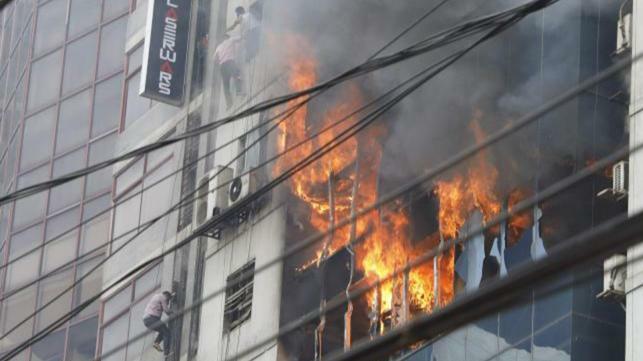 A massive blaze in Old Dhaka on 21 February killed at least 70 people and injured 50 others. A June 2010 fire in Old Dhaka’s Nimtoli killed 123 people. In November 2012, a fire swept through a nine-story garment factory near Dhaka killing 111 workers.